We tend to forget things that happened 17 years ago. Fortunately, Takahiro Omori found the best way to remind us. Back in 2001, Omori won an FLW Tour event on Lake Martin. Apparently, he still remembered a few things about the lake all these years later, as he scored his second victory on Martin by winning the BASS Elite Series opener there over the weekend. In a tough event, Omori found something all to himself – a small spot tucked behind an island up the lake where current happened to be flowing. It took some creativity to get there due to the water being so shallow, but once he did he caught no shortage of fish on a TO craw-colored Lucky Craft LC Silent Squarebill 1.5 crankbait. 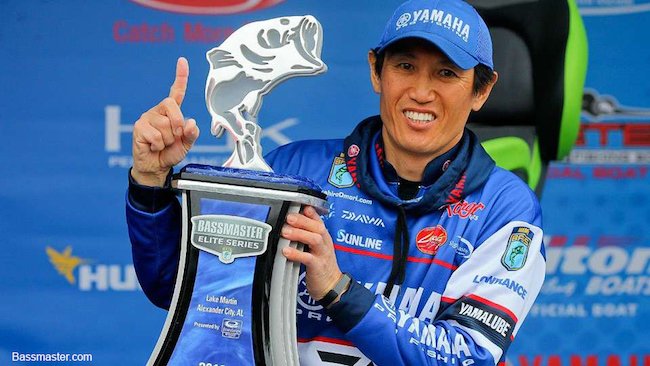 The win was Omori’s second major victory in the last 3 years, and both came in Alabama (he won at Wheeler Lake in 2016). It also marks a significant turnaround from a miserable 2017 season. Omori’s average had dropped nearly 80 points in the previous 12 months. Yet, his victory jumped him up nine spots to 55th in the two-year Majors Ranking. Meanwhile, Jacob Wheeler had his worst major finish since 2011. That’s significant because with Bryan Thrift dropping his worst finish in the last five years, Thrift has once again taken hold of the No. 1 spot. That wasn’t the only noteworthy move in the top 10. Last year’s Elite Series Rookie of the Year, Dustin Connell, debuted at No. 6 in our rankings, as he’s beat more than 80 percent of the field on average to start his young career.